Earlier this morning I received a message from the lovely Betty of Vodka and Impropriety to say that she has nominated me for the Liebster award! What an honour. From reading about this award, I’ve found that it is given to bloggers, by bloggers. To be nominated by my contemporaries is truly fabulous. And Betty’s blog is such an entertaining read, and so chic and polished, that it really is a privilege to have been nominated by her. Thank you! It’s a way of “newbie” bloggers (those with less that 1000 followers) to get some exposure and generate a readership. It welcomes new bloggers into the world of blogging. The Liebster award is just a really nice gesture. 1. After being nominated, post the award on your blog and thank the person who nominated you! 2. You’ll be given a list of questions to answer from whomever nominated you. Answer these! 3. Pay the gesture forward… Nominate between 5 and 11 fellow bloggers, linking to their blog. 4. Compile your own questions for your nominees. 5. 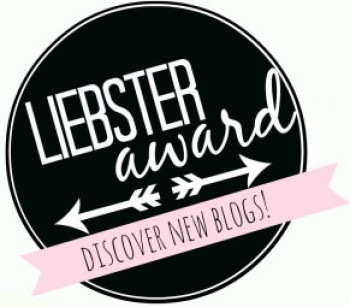 Let your newbie faves know that you dig their blog and have nominated them! I’ve always loved writing, and I’m not sure really why I didn’t go down the journalism route for a career. I’d been accepted to start my MA with the University of Edinburgh but my circumstances changed and I couldn’t commit to it, nor could I finance it. I was really disappointed so my wonderfully clever hubby suggested I start a blog to get my writing “out there”. I found my voice and went for it! Well, firstly my son is my number one interest. I just love spending time with him. I’m a teacher and have struggled with the work-life balance, so I’m going part time to spend more time with Noah. I’ve also got into fitness in a big way over the past four months. I may not be the most ripped, or the fittest, and I certainly don’t have the body of someone who goes to the gym 6 times a week, but I do and I love it. It’s an amazing outlet for any frustrations that I have, and it’s how I like to spend my “me time”. I like to think I’m not a fitness bore though, I loved food, drink (probably why I’m still a size 16 despite my efforts with my workouts), reading, watching American comedies (in the box set queen). I’m pretty normal and do pretty normal things. So many people inspire me! My family and friends, fellow bloggers, people on social media! My blog posts are sometimes a bit random because I get inspired by someone and go with it, even if it doesn’t quite fit the “theme” of my blog! Unexpected encounters or observations inspire me too. We’ve just driven past a stack of hay bales with smiley faces painted on them and it made me smile, which made me think about writing a blog about what little things make me happy. Everything in my head is now linked to this blog. Wow! A tough question. I don’t think I could narrow this list down. Obviously my closest family and friends are of the upmost importance to me. Noah and Andy are top of my list, but so closely followed by my immediate family that I almost feel guilty by naming them! I couldn’t survive without my sisters, parents, wifey, Nanna or in laws. Then there’s my friends. My ultimate support network. I think I’m pretty lucky to have the problem that I couldn’t single out one or two people to name as my VIPs. This question made me smile. I’m thirty in a couple of weeks, yet still don’t feel like a grown up! I have the illusion that when I grow up I’ll live in the middle of nowhere, with my hubby and kids and five dogs, and I’ll write and make money from this! I just don’t see me being a grown up this side of forty! And I’m quite ok with that! If you received and all expenses paid vacation, where would you go and what would you do? That’s easy! I’d travel America! I’d hit up NYC, go to Vegas, do Route 66, and travel up the west coast for a month or two! I’d finish off in Seattle- oh, with a stop off in Hawaii for good measure! When I’m spending time with my little man, who is my favourite person to have a conversation with in the entire world! Nothing beats a toddler’s view on life! What is one piece of advice you would give to a group of children? Don’t be afraid to be unique. There’s nothing wrong with breaking away from the crowd and living your own life for you! Worry less about the opinions of others and concentrate on being someone that you want to be. What is something you read recently (book, news article, blog, etc) that excited/fascinated you? I re-read To Kill a Mockingbird, followed by Go Set a Watchman, and the issues still broke my heart. Both books fascinated me in a way that made me think about life and how humans treat, and mistreat, each other. These books were written 50 years ago and I wonder if progress really has been made? The cynic in me thinks not. Why, thank you! I just use what my mamma gave me! I really can’t take any credit when I’m surrounded by more awesome people than myself! Which blogs do you rate and which inspire you? Which songs best represent you and your life? What’s the ultimate message you’d like to pass on to your readers? PreviousPrevious post:Wish list Wednesday: the book editNextNext post:Karaoke Queen?